Meet Amy the Amigurumi Doll! She was inspired by a bunny I loved on my daughter's shirt. The skirt shirt combo caught my eye and every time I saw it I wanted to try and crochet it as a doll! My daughter was thrilled their outfits matched as well! 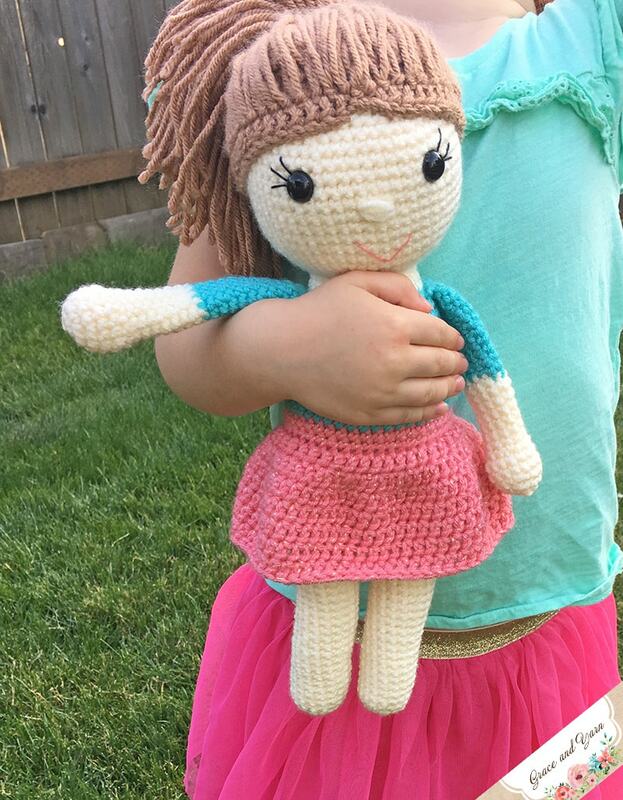 She measures about 14 inches from head to toe and is a great pattern for beginners! The legs and body are made as one piece making the pattern work up quickly! 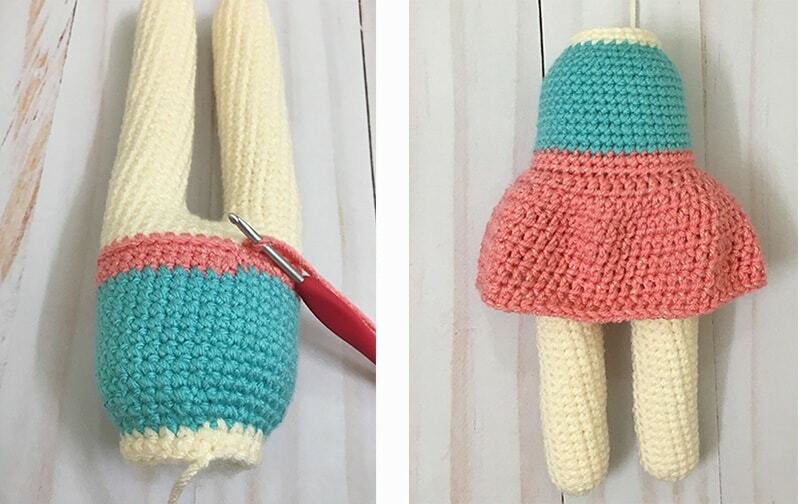 This pattern was originally released as a CAL (crochet-a-long) that has now ended, but it will remain a free pattern here on the blog which is why I have combined all parts of the pattern into one below! Be sure to join the Grace and Yarn Crochet Group on Facebook so you can share your WIP as you go and ask any questions you have along the way! 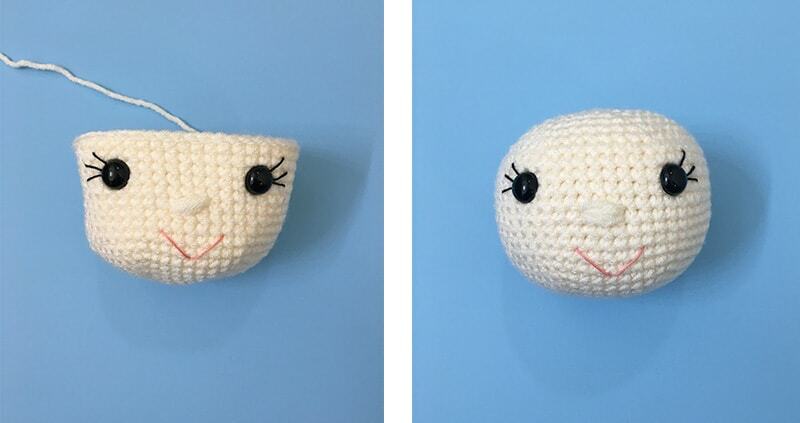 I have used plastic safety eyes in this pattern but if you would prefer an alternative I have a tutorial for crochet eyes here! The pattern will be worked in the round and I highly recommend using stitch markers if you don't already. This is one material you don't necessarily have to purchase. A piece of scrap yarn, safety pin or bobby pin will work just fine! - PIN it here to save to your favorite board! 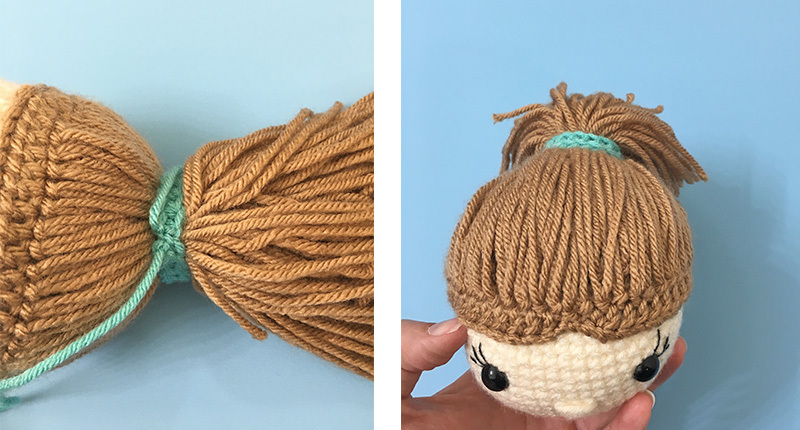 If you are new to amigurumi be sure to check out my tips and materials page to help get you started! Tapestry needle - I love the bent tips! 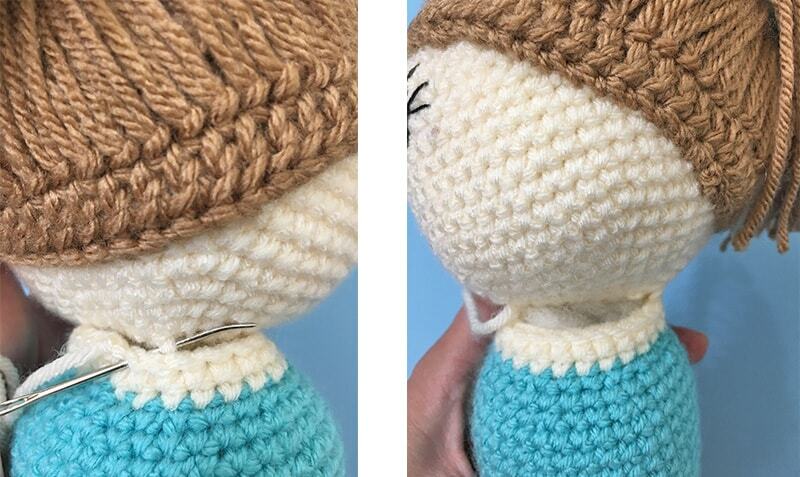 The biggest question I had when first making amigurumi dolls was finding yarn for different skin colors. Here's a few to try out depending on the shade you are looking for. 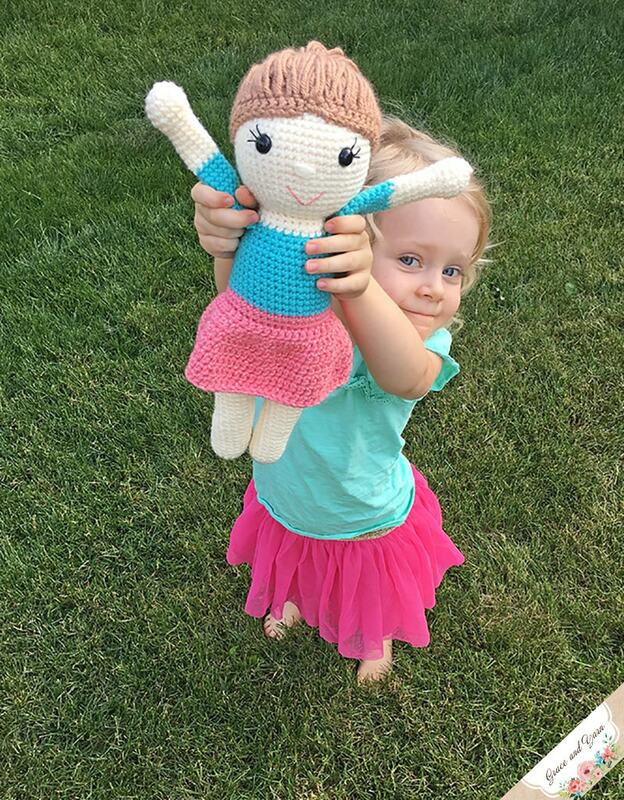 I love that there are MANY options, making it easy to make your doll in the likeness of the little one you want to gift it to! Round 31: Chain 4 and attach to the first leg with a SC, SC in the remaining stitches around the leg, when you reach the chain make a SC across each of the 4 chains, SC in the remaining stitches of the next leg and across each of the 4 chains (you will have SC on both sides of the chain 4 now) (40 SC) This completes your join and is where your next round will start. Note: Here is where we will add the facial features before we start closing the head. Insert the eyes between rows 16 and 17, 9 stitches apart. Using same color yarn, place the nose two rows beneath your eyes and 3 stitches in on each side (this will leave 3 stitches in the middle and this is what you will pass your yarn through to create the nose). Pass your yarn through 4 times (or as many as you would like for a thinner or wider nose). Using your pink embroidery thread (or pink yarn) make a ‘V’ for the smile. *Stuff your head as you go. To make the hair we will make a hair hat or wig to sew on. This is very similar to the spine hat we made on the amigurumi Hedgehog! Cut multiple strands of yarn about 16 inches long. 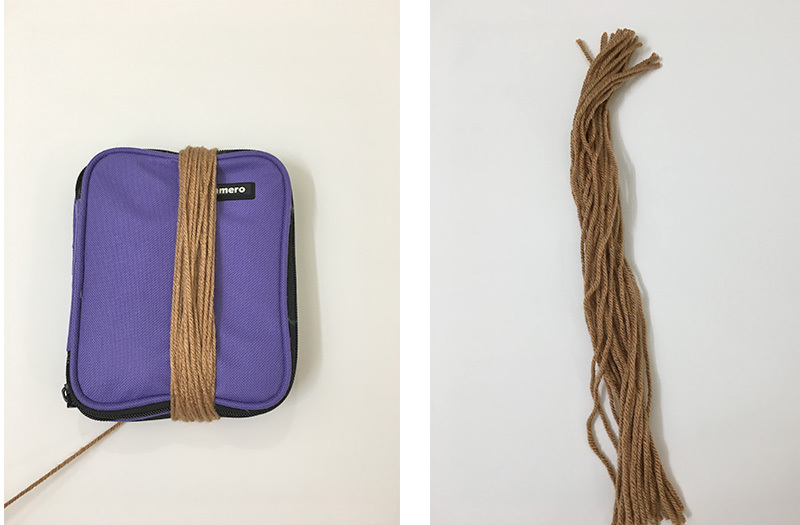 I wrapped yarn around my crochet case (you could also use a DVD or something similar) and cut one end. This will speed up the process as you will need MANY strands of yarn. Take your first strand of hair and slip stitch through a stitch from round 14. Continue this around for each stitch on rounds 13 and 14. Put on a good movie, this part takes some time but the hair is so cute it's worth it! When you have all of your hair on, line up your hair hat onto the head and sew on. The part can either be in the middle or off to one of the sides. I placed mine just above the highest part of the eyelashes. 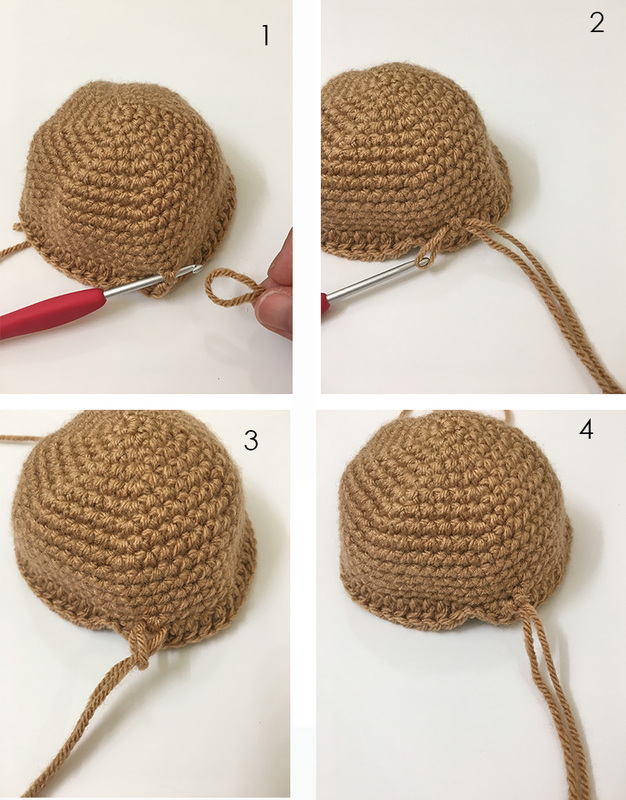 Using your bent tip or straight needle go through one of the stitches on your hair hat and into the top stitch on the head. Continue around until hair hat is secure and fasten off. Pull the hair back into a ponytail and secure. I used a piece of the same colored yarn with a double knot. No need to weave in the ends, it will blend in nicely with the others! Fasten off leaving a long tail, place around the ponytail and sew ends together. Trim any hair that seems uneven. At the end of round 23 pinch the arm flat and make 5 SC across the top to close, fasten off and leave a long tail to sew onto the body. Sew the head onto the last round of the body, making sure to have the facial features centered. Add more stuffing as you go to make it firm and less wobbly. Feel free to use pins to hold it in place. I like to place the head where I want it and see what round on the bottom of the head I want to try to sew onto, it gives me a visual and helps keep it even all the way around. I used the same technique here as when we attached the hair hat to the head. Last, sew the arms onto the body centered with the head at row 50. Your doll is complete! I hope you have enjoyed making this pattern. Feel free to add a little bow or flower to accessorize! The flower in the Berry Patch Bunny or bows from Emma would make a great accessory! Love, love it!! Thank you so very much. What a great way to share and make little girls happy!! Plan on making many to donate! Thank you Barbara, I'm so glad you enjoyed it! Thank you for the pattern! I'll be making a few of these for Christmas this year. Very beautiful pattern!